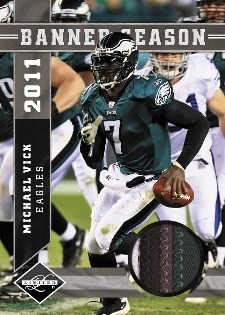 2011 Limited Football from Panini is just that. Every card in the release, from base cards to inserts, is numbered to 499 or less. 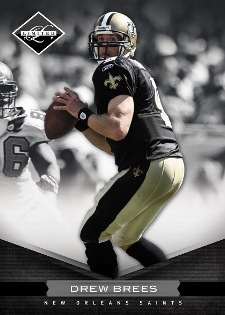 From memorabilia cards featuring jerseys and hats worn at the 2011 NFL Draft to on-card autographed jersey rookie cards, this year's rookie class is highlighted by lots of compelling content that makes Limited stand out a little more than some of the other high-end football sets released this year. At the same time, the sticker autographs used for some of the hits may seem out-of-place for such a high-end product. Single-pack boxes come with three hits, two base cards, one Legends subset card and one rookie card. Every card in the product, including base cards, is numbered to 499 or less. 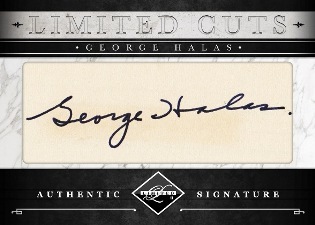 Autographs numbered to 299 or less; memorabilia cards numbered to 199 or less. Material Phenoms rookie cards (/299 or less) all have on-card autographs and prime memorabilia swatches. Draft Day Lids & Jerseys (/199 or less) include pieces of the hats and shirts worn on stage by 13 rookies after their names were called at the 2011 NFL Draft. Limitless autographs (/199 or less) aim for some of football's biggest names, such as Sam Bradford, Michael Vick and Adrian Peterson. Cut signatures included in Limited Cuts. 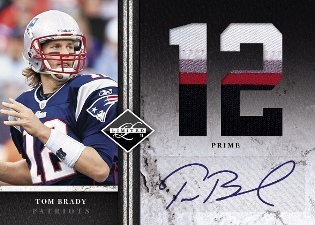 Jumbo Prime Signatures combine patches and autographs. Banner Season and Spotlight Phenoms among the additional memorabilia sets. Rookie Lettermen (/10) use the familiar mix of signatures on letter patches. Nice looking Product and low numbers! I would get it while you can!!! I was extremely disappointed by my box; a Kerrigan auto, an auto from the Redskin Full Back who I can’t recall right now, and a 1/C Frank Gore swatch. For a $100? I was not nearly as impressed as Jake was. i love the limited brand nothing better then getting straight to the point instead of opening 24 packs and getting couple hits..just got a Paul Brown 2out of 3 limited cuts auto hof coach that helped with making the nfl what it is today..they named the browns stadium after him aswell as a museum!! AARON RODGERS 2011 PANINI LIMITED MONIKERS AUTO AUTOGRAPH JERSEY CARD #19 20!